4th April 2016 - Thank You! 17th March 2016 was not only St Patrick’s Day, it was also a very special day for Catch Up®. It was a day of celebration and happy memories as we gathered to say a special thank you at the retirement of our longest-serving and most dedicated Trustee, Suzy Webster. It’s probably fair to say that without Suzy Webster there would be no Catch Up®. She was there right from the start, back in 1995. At that time, Suzy was Director of a grant-giving trust, World in Need. The trust operated by identifying a need, starting up a charity to meet this need (including Oxfam, Help the Aged and Action Aid) and supporting it with funding and help with governance, until it could be self-sustaining. The trustees had decided that for their next project, they wanted to support an educational programme that particularly addressed the problems of struggling learners AND had shown promising results. Suzy visited a number of Schools of Education and spoke to many people in the field, but kept hearing more about problems than potential solutions. Then, by an act of serendipity, she met Diana Bentley and Dee Reid and heard about the exciting results the two of them were having helping struggling readers. Suzy was convinced, but how to convince her trustees that this was something the trust should back? The answer was a little red-haired boy. Suzi Clipson-Boyles, who was studying for her PhD at Oxford Brookes University, and knew about Dee and Di’s work, set up her video camera in a room in the local primary school and set it on auto. In through the door came the little red-haired boy. He did NOT want to be there, as the scowl on his face clearly showed, and anyhow, he thought reading was for girls and sissies. Suzi sat him down, and proceeded with the conversation familiar to all who know Catch Up® Literacy. After 10 minutes or so, a transformation had come over his face. With a big smile, he said, ‘Can I come again next week, Miss?’, and sauntered out. 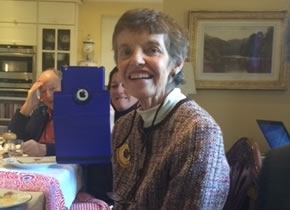 At the next trustees’ meeting, Suzy Webster gathered the trustees around her rather small laptop and showed them the video. The little red-haired boy did the trick, and World in Need‘s support over many years saw Catch Up® grow from such humble beginnings to the highly-respected and successful literacy and numeracy interventions that have made a difference to the lives of over half a million struggling learners. Suzy has been a guardian angel for Catch Up® for over 20 years. She always has our interests in mind and she never loses an opportunity to promote Catch Up®. And the good news is.…. it’s not goodbye, as Suzy has agreed to become an ‘Ambassador for Catch Up®’, so we will still be able to benefit from her energy, enthusiasm and expertise.